New Delhi, Oct 13, 2014: Artistic geniuses and legends in their own right, both Khwaja Ahmed Abbas and Begum Qudsia Zaidi were born in the year 1914 in a pre-independence India. While the former went on to become a leading journalist and an eminent script writer in the Bollywood of Nehruvian years, the latter is renowned for her pioneering role in establishing the Hindustani Theatre in Delhi. As India celebrates the centenary year of the two writers, Delhi Government’s Department of Art, Culture & Languages in association with the Urdu Academy is presenting a six day festival dedicated to the two literary greats. The 26th Urdu Drama Festival was inaugurated this evening by Shri S S Yadav, Secretary, Art, Culture & Languages, Government of Delhi at the Sri Ram Centre Auditorium. 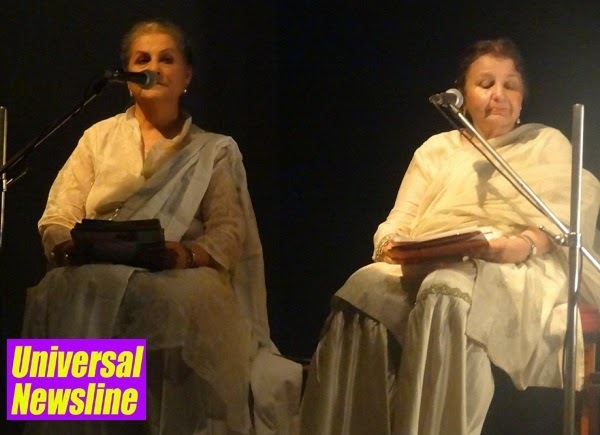 The festival began with the staging of ‘Khayalat Ka Saudagar- Abbas’, a play based on the life of Khwaja Ahmed Abbas, written and directed by Ms Zakia Zaheer and presented by the Khwaja Ahmed Abbas Memorial Trust Theatre Group. The first three days of the festival will be dedicated to the plays of or on Abbas while the last three days will see the staging of plays scripted by Zaidi. “A writer, a journalist, a film maker, Khwaja Ahmed Abbas was a towering figure in India’s literary circuit and in some ways he lead the avant garde cinema in Bollywood during the 1970s when he penned films like Neecha Nagar, Jagte Raho and Saat Hindustani. His writings symbolized the spirit of Nehruvian socialism and gave a voice to a young India’s quest for social justice and equality. During the same years, Qudsia Zaidi led a very different movement by laying the roots of Indian theatre. It is a matter of pride for us that we are paying tribute to these two legends through this festival,” says Anis Azmi, Secretary, Urdu Academy. The second day of the festival, October 14, will see the staging of the play Angrezi Ki Galtiyion Se Bhara Ek Khat’, written by Khwaja Ahmed Abbas, directed by M Sayeed Alam, and performed by Pierrot’s Troupe Drama Group. ‘Abbas Ke Do Rang’, directed by Amitabh Srivastava and performed by the Three Arts Club will be staged on Wednesday (October 15). On the fourth day of the festival (Thursday), ‘Jaan Har’, a play written by Begum Qudsia Zaidi and directed by Sheikh Khairuddin will be performed by the Living Theatre Group, while the fifth day (Friday) will see the staging of Qudsia’s ‘Khalid ki Khala’, directed by Chander Shekhar Sharma and performed by Mask Players Art Group.